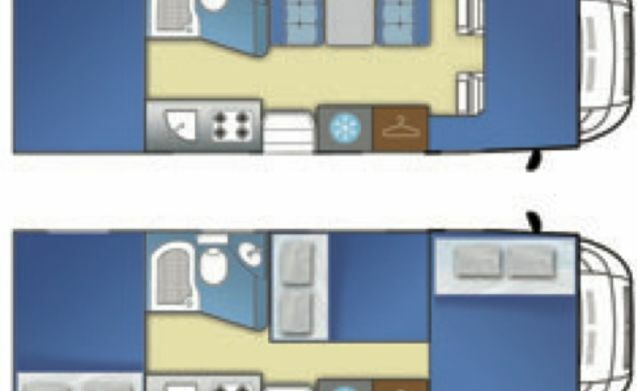 From private to rent, very spacious and complete 6-person camper. 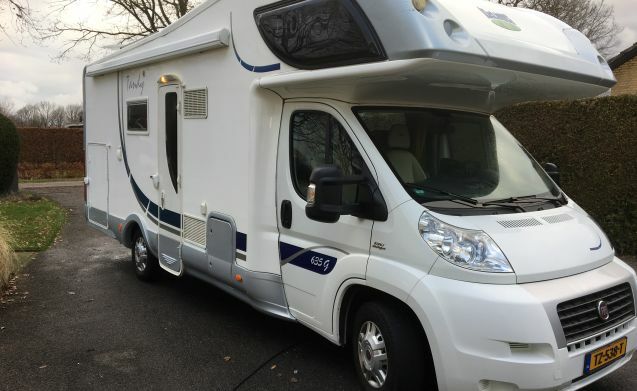 We are real motorhome enthusiasts, have been motorhomes for more than 25 years and in 2016 we have rented our own motorhome for the first time and that is good, and the tenants apparently (see the reviews). After many years of loyal service, we sold our trustworthy Eura Mobil and at the end of 2018 we bought back a very beautiful and luxurious McLouis Tandy 635G. We are also real motorcycle enthusiasts. Are you also and would you like to take the motorcycle (s) with you on a trip? Which can! The camper has a towbar and may be used in combination with a special motor trailer (suitable for even 3 motorbikes!) That you can also rent from us. The trailer is up to 750 kg. 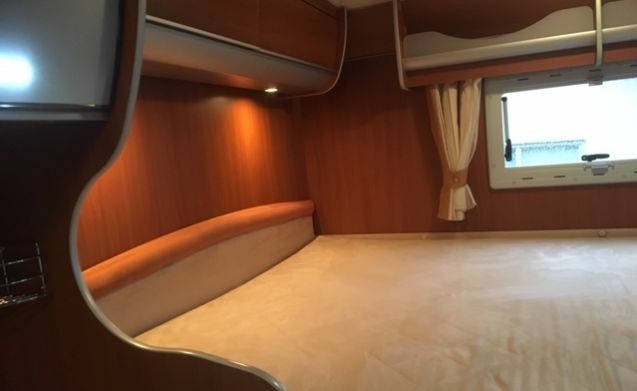 so without using driver's license E.
The camper is really well equipped and very suitable for a family, but a couple who likes to have some space, will certainly feel at home. The camper has 6 seats with belts, 5 of which are on license plate. There is a very complete inventory for 6 people present including 6 lounge chairs, a large table and a parasol. The dimensions of the camper are: 7.26 (L) x 235 (Br) x 3.215 (H) meters. The running weight is 3064 kg. There is a lot of (storage) space, for example in the XXL garage which is also accessible from the inside through a door. On the back of the camper is a bicycle rack for 4 bicycles (or 2 electric bikes), while in the garage there is also a bicycle rack for the transport of 2 (electric) bicycles. The upholstery of both the cab seats and the seating group is made of cream leather and luxury. The table of the seating group can be extended considerably with an extra extension. The passenger seat is rotatable so you can join the seating group. The entrance door of the camper has a window that can be darkened with a rollo. A separate sliding door keeps the insects outside when the door opens. There are large beds (with good mattresses) and sleeping places for 6 people, including safety nets on two of the three beds. Alcove bed (bed above the cabin): 160 x 210 cm. Lounge bed: and a bed after conversion of the seating group: 130 x 190 cm. A high and wide wardrobe (70 cm) ensures that you can hang your clothes etc. 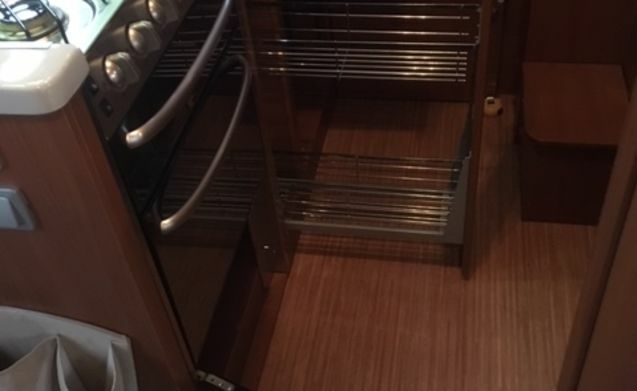 and there are many cupboards for the other stuff. 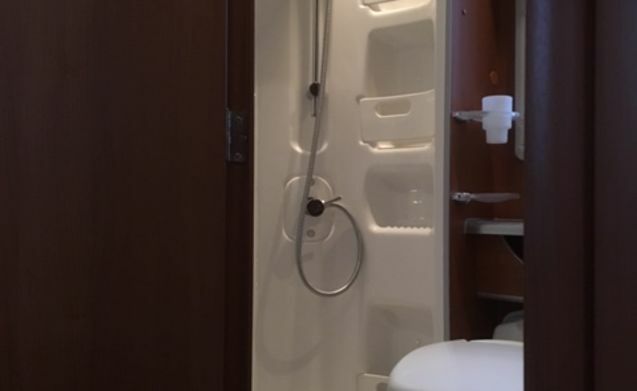 The bathroom is equipped with a shower (separate cabin with swing door), 220V socket, toilet and also equipped with window and a roof hatch. There are also cupboards and washbasin with mixer tap. A special 7 inch camper navigation is on board and ensures that you can travel relaxed throughout Europe. A lot of camper places and campsites, but also many other POIs (Points Of Interest) are easy to find, because they are included in the navigation system, which also takes into account height, length and width of the camper when calculating the routes . The latest ACSi guides 2019 are available both in book form and in the navigation system. Furthermore, there is a multimedia radio (dubbeld, MP3, bluetooth, DVD, etc.) on board of which the large screen also serves as a screen for color reversing camera. There is also a WiFi router (latest type) on board, you can set up your own network. On top of the fully automatic TV dish is a special antenna mounted for the wifi, so you always get a strong signal! The onboard battery of 100 amp. takes care of the power and there is also a converter from 12Volt to 220Volt (1500W / 3000W), so you can, for example, simply make coffee or tea on the go without being dependent on a power connection. The battery is charged while driving through the car, at the campsite via the 220 volt connection and there is also a solar panel on the roof that charges the battery. All lighting is equipped with LED lights, so very energy efficient and that improves the battery life. Furthermore, there are 100 liters of clean water and 100 liters of waste water tank, the 10-liter boiler provides hot water. A good stove (Truma) with a round blowing system and thermostat ensures a pleasant temperature in the camper. There are 2 large gas bottles (with duomatic including a crash sensor) on board, so you can have the heating, refrigerator, boiler running on gas on the go. 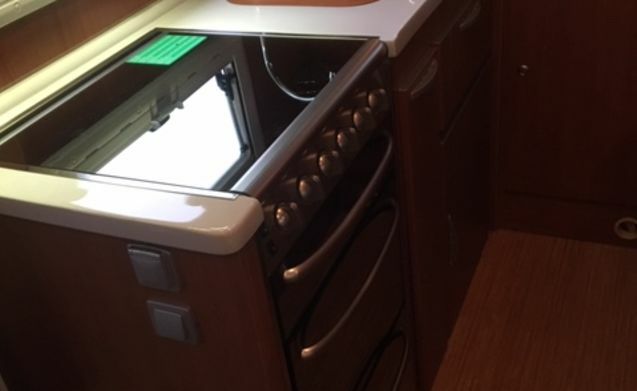 The kitchen has a 4-burner stove, with hood and also a separate grill and a separate oven, quite unique in the camper world! The many cupboards plus a pharmacy cupboard ensure that you can get rid of all the stuff. The fully automatic and very large refrigerator with separate freezer compartment operates on 12 volts, gas and 220 volts and cools very well. Of course, cutlery, extensive crockery, pans, etc. are available for 6 people. Various roof hatches also ensure sufficient fresh air. All windows can be opened and are also equipped with blackout blinds and fly screens. You can watch different channels on both TVs and DVD can be watched while driving. There is also a spacious canopy 4.00 x 2.50 m. Under which you can sit sheltered. Because of the special camper chassis, the camper has a good roadholding. The diesel engine is 2.3 liters, powerful (131 hp) and drives very comfortable. Electrically operated windows and mirrors plus cruise control are available. The front doors are equipped with additional Heosafevigheidigheidslloten and can be centrally locked via the car key. Both garage doors and the entrance door are equipped with additional Fiamma security locks. 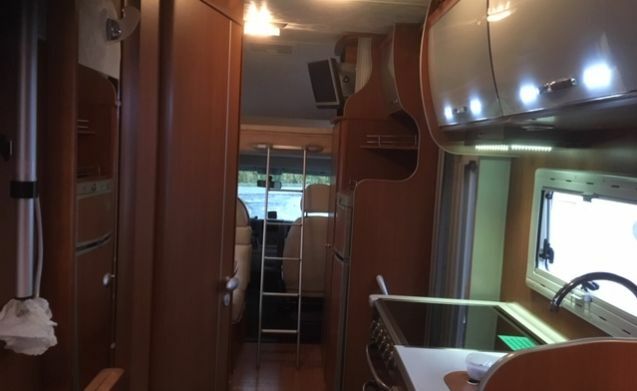 The camper is very complete and very luxurious, completely ready to leave on vacation. You will lack nothing. 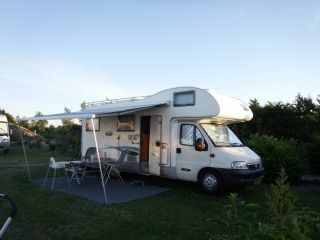 The camper is always well maintained and we are very economical. You will receive an extensive user manual (with photos) and an inventory list sent in advance by e-mail, and of course you will receive it printed on a trip in an extensive information folder. We also give a complete explanation on the spot when picking it up. You can park your car for free (at your own risk) on our premises, even under a carport. The driver (s) must have driving license B for at least 5 years. The camper must be returned with a full fuel tank. Liquids (gas, toilet fluid, waste water tank cleaner) can be settled in consultation or will be fully replenished. 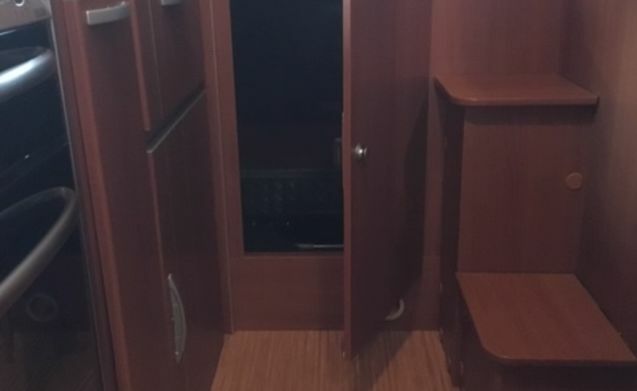 We have noticed that it often causes stress and inconvenience to completely clean the camper at 11:00 (both from inside and outside, so as you have taken it into use), to return to us. That is why we take care of the cleaning (both from the outside and inside). We charge you € 50, - for that. 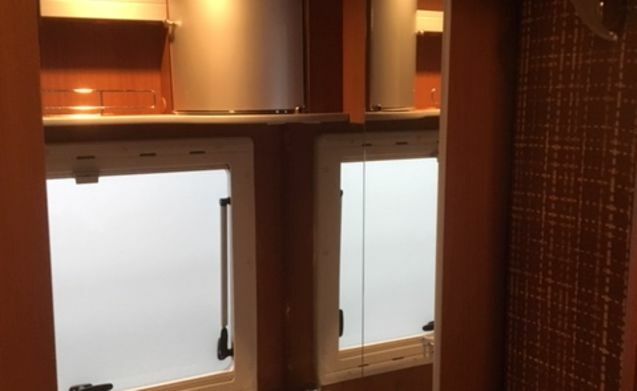 If the camper is extremely dirty returned, or it is found that there is still smoked, (unfortunately we have experienced), this at the discretion of the landlord, then the camper will be cleaned by a professional company at the expense of the tenant. With this we ensure that the camper is always clean and fresh and remains. You can park your car (for free) with us and, without the worry of cleaning, continue to use the camper until the last moment and then return it to us. Response from Johan Grad en Ingrid zijn voor de eerste keer gaan kamperen en dan gelijk maar met een camper. Zij hebben daarvoor onze camper uitgekozen en het is hen gelukkig heel goed bevallen. 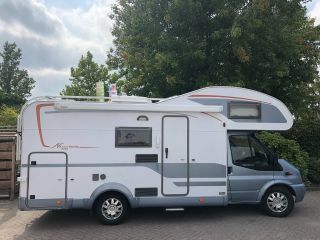 Wij hebben heel leuk contact met hen gehad en de camper is keurig schoon teruggebracht. Het is zowel voor Grad als Ingrid als ook voor ons zeker voor herhaling vatbaar. Lovely trip and family camper!